Structural steel erection and steel frame construction can both be very dangerous endeavors. OSHA has released regulations and revisions to ensure the best safety practices are followed nationwide. If you have a project that involves the complex process of steel structure building, it is essential to find a team that has the experience and training needed to ensure optimal safety throughout your project. Our steel erectors in Michigan have worked to provide the best outcomes across the state since 1967. Sanilac Steel was founded to deliver professional, comprehensive results in a safe and honest manner. Taking the proper measures to brace your steel structure during construction is essential for everyone’s safety. Today, we’ll conclude our look into a few of these safety requirements to give you a better idea of our quality approach to steel construction services. When you’re done reading this post, be sure to contact our team to receive your project quote! The connection between your steel structure and the foundation will do much to provide support both during construction and throughout the lifetime of your building. These bolted connections are similar to the connections mentioned in our previous post, but the threaded end is often embedded in concrete. Anchor bolts rely on nuts, steel plates, and stiffeners to provide superior resistance to shearing and cracking. Making the connection between the concrete and your steel frame construction is vital in establishing a durable base. This area often holds the most potential for error, which is why it is recommended to find steel contractors such as Sanilac Steel for assistance. The comprehensiveness and quality of your structure’s welds will play a primary role in the building’s overall strength. Welding crews will be required to follow complex and demanding schedules for steel structure building, working on column connections, column splices, beam spans, and other vital points. Any mistakes or missed welds, even the most minor ones, can result in serious hazards on your site. Statistics prove that unfinished welds have attributed to numerous steel collapses. Sanilac Steel is proud to be your comprehensive steel erection team, including our mobile welding services, crane rentals, and more. We’ll work with you every step of the way to ensure that every phase of your building is done completely and in accordance with all regulations and design specifications. Lifting your steel frame into place requires the use of machinery to hoist large pieces of equipment across the jobsite. In many applications, materials are transported from a preparation site to the working area. A large number of preventable accidents stems from incidents including personnel and hoisting operations, making it essential for you to work with a team that is prepared for the job. Our steel erection team has the training and certifications to ensure that your site is safe at all times. It can prove to be a challenge when trying to coordinate structural steel erection in tandem with your other building services, which is where Sanilac Steel’s expertise can shine. Contact us today to learn about our proven steel erection services! OSHA regulations also come into effect in terms of fall restraints when working at heights of six feet or more. Slips and falls account for a large number of casualties in the construction industry, making it essential to develop a comprehensive safety plan for all fall protection services. Taking the proper measures to secure both personnel and materials from falling will also help to minimize the risks associated with falling objects. 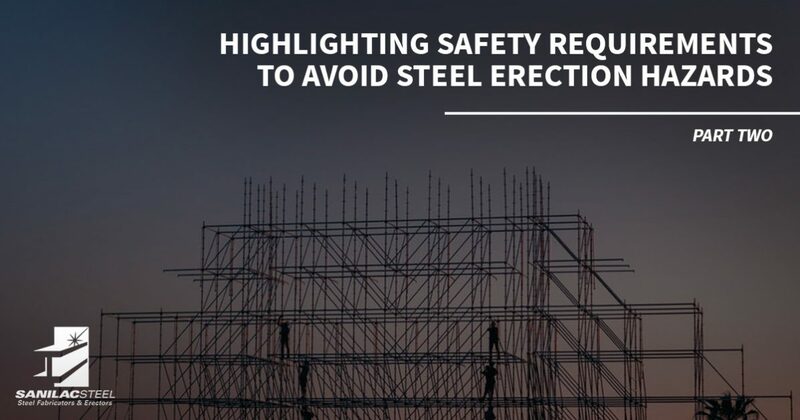 Statistics have revealed that steel erection has proven to be among the most dangerous professions in the construction industry. Not only is this position hazardous, but failure to follow proper protocol can result in collateral damage to other individuals. Failure to be complete in any of the safety measures mentioned above can result in very dangerous results, making it essential to find a steel-frame construction company with a record of successful outcomes. Sanilac Steel is here to serve as your guide throughout the steel construction process. Our experienced team understands the challenges unique to every project, and we’ll work with you every step of the way to ensure the best outcome. Our team is dedicated to safe outcomes. Contact our steel erectors in Michigan today to receive your project quote!